3ds Max tutorial. Create blurred car lights in your night visualizations. To create believable night city visualization, we need to follow some rules of photography. One of them is maitaining “realistic” shutter speed. In the night, when there is small amount of light, we make photos with longer exposure times to avoid noisy images. One side-effect of this is that every moving light source becomes blurred. It is the most prominent effect when shooting night streets – red and white car lights become smudges. How can we create such effect in our visualizations? 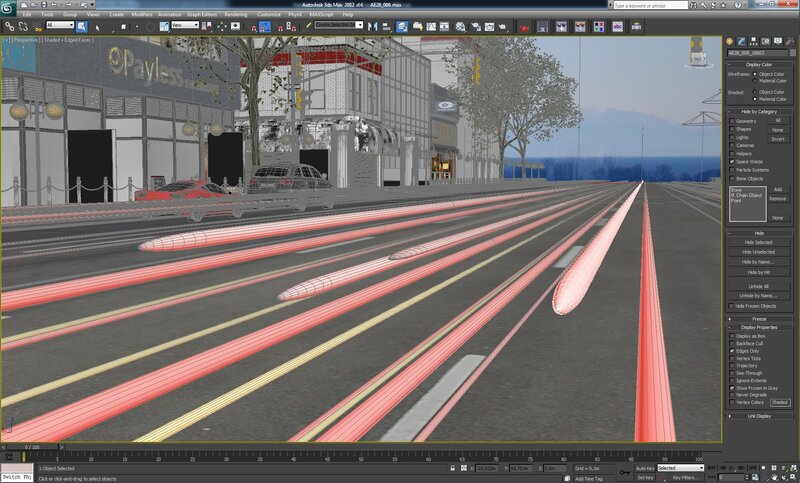 Some artists use Photoshop layers for that, but if you want to truly control direction of moving lights and their effect, you can use 3ds Max for that. Blurred lights that simulate moving cars in the night. First of all, we created some cylinders and stretched them over the street. Then we assigned red lights material to cylinders. We used falloff map for opacity, because our cylinders should fade on the edges. Falloff direction goes in Z-axis, meaning that the more distant polygons of the cylinders have lower opacity. We used two noise maps for our noise gradient that is placed as front of fallof map.